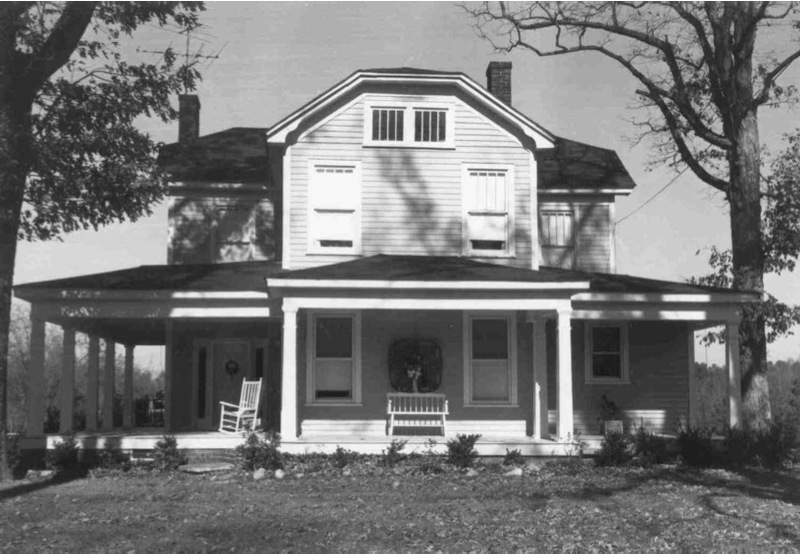 Barbara and Allan Powell earned the 1986 architectural conservation award from the Historic Preservation Society of Durham for their rehabilitation of the unusual two-story Craftsman- style dwelling built by Odie and Sally Umstead in 1926. The house was badly deteriorated when the Powells purchased it in 1983 along with 50 acres of the original 350-acre farm. The four-bay frame dwelling has a right-angle plan and is distinguished by its cruciform shape and clipped-gable roof. The main block, oriented east-west, has a perpendicular ell in the center of the south facade and a perpendicular ell in the center of the north facade. A wraparound porch, supported by tapered posts, follows the shape of the house. Fenestration is Craftsman- style; four-over-one double-hung sash windows are placed symmetrically on the south and west facades and on the first floor of the east facade. The attic is illuminated by pairs of small windows with four vertical lights that are placed directly beneath the clipped gables on the south and east facades. Elsewhere fenestration is asymmetrical and arranged according to requirements of the rooms within. In order to save the house, extensive renovations were required, but most windows and doorways, flooring, several mantels, a staircase with square newels and spindles, and tall brick chimneys were retained. Alterations included re-siding portions of the house, moving the front door from the center bay of the south facade to the westernmost bay, building a bathroom on the east facade, replacing several windows on the west facade, sheetrocking over pine paneling on the interior, and replacing a mantel in the west wing with a new one made of wood salvaged from an antebellum house once on the property. A new one-story kitchen ell has been added to the north facade. North of the house, an early-twentieth-century smokehouse and privy remain on the property. Mid-twentieth-century farm buildings nearby are a frame equipment shed and a tobacco barn. A cemetery west of the house contains graves of the Green and Rogers families. Among twelve graves, mid-nineteenth-century markers are for Eleann M. Green who died in 1862, Benjamin Rogers who died in 1866, and Ann[a?] Green who died in 1868.